It was July 3rd and I’d been back in Alaska barely long enough to trek through Denali National Park when my friend Teo called asking if I wanted to hike the Rabbit Lake Trail to celebrate Independence Day. He had a couch surfer with him just like our winter hike across a frozen lake and I knew this would be another great day in the mountains so quickly said yes and packed my bags. 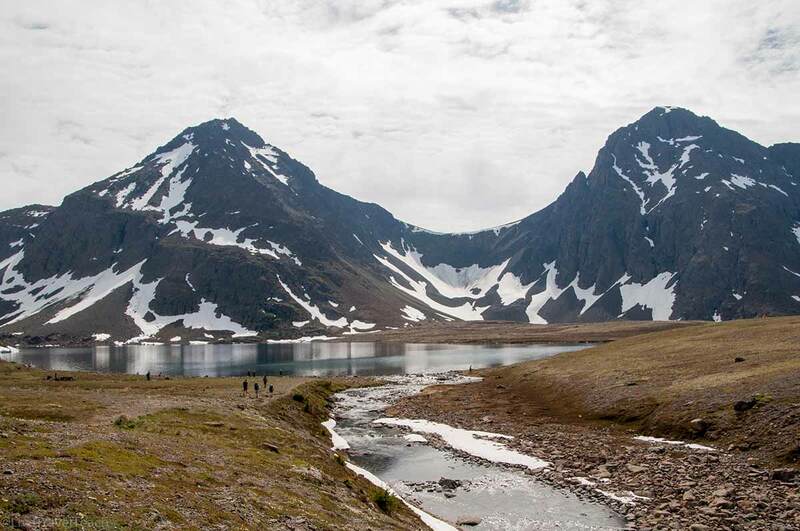 The Rabbit Lake trailhead is easy to get to from Anchorage using Google Maps and should only take 20-30 minutes. Drive as far down the road as you can and the trail will be straight ahead of you. There aren’t any major turns and although the rabbit lake hike is almost 9 miles round trip, you only gain about 1200 feet of elevation. We had a 12-year-old, first-time hiker with us and she rocked it. I’m confident that anyone who wants to enjoy a day outside can traverse this path without too much difficulty. Don’t risk a $50 parking ticket! Visiting Alaska? Pay a $5 parking fee at the trailhead. These backpacks are perfect for trekking Rabbit Lake or anywhere in the world! Ancient rivers cut a steeper a V-shaped canyon as you begin the hike and you’ll gain most of your elevation in the first half-hour. Once the trail settles off there’s a beautiful side path on your left that leads up to the northern ridge. We stopped for a quick break here before continuing onwards. Before long the trail flattens off and the river widens out. You’ll notice a more gradual slope here in a U-shaped valley likely carved by a glacier. It took us about an hour and a half to reach Rabbit Lake Alaska and we were instantly rewarded with a beautiful view! Behind the lake sat two peaks, Suicide North and South were almost perfectly reflected in the still lake. We took our packs off and ate lunch while dipping our feet in the icy waters. Snowbanks still covered some of the far shores in this wonderland. One hiker inflated his stand up paddle board while another dove headfirst into the chilly lagoon. A few dogs roamed the shores while another chased a stick into the water before changing his mind and heading to the center to investigate a kayaker. His owner got a little worried but that pup can swim like a champ despite the chilly waters here at Rabbit Lake. Did you know that travel insurance covers more than just injuries? Click Get a Quote and find out how affordable it is! We didn’t bring fishing any rods but a few others did and someone else mentioned that they stock the lake. Bring your own rod and read the guildlines for Fishing in the Anchorage Bowl before you fish in Rabbit Lake. Even though I mention all these great activities to do at Rabbit Lake Anchorage we were here on a weekend in tourist season and thankfully we didn’t see more than a dozen people at the lake! Hikers, bikers, and runners regularly came to the end of the trail for a quick view before departing but only a few of us chose to hang out at the lake. You can easily picnic at Rabbit Lake or if you want to have some more privacy you could simply head around the lake or over the rightmost ridge to McHugh Lake. Camping is only allowed over ½ mile from the trailhead or developed road. Open fires are not permitted. Portable camp stoves are permitted. This info is taken directly from Alaska.gov. Download a Rabbit Lake +McHugh Lake Guide here. Teo mentioned that McHugh Lake was perfect for a quieter scene and we could even attempt to summit Suicide South so we crossed the river and passed a solitary tent just out of sight from the main trail. We walked up a slight hill and could see the blue waters of McHugh Lake before us. Pin this photo on Pinterest if you’re enjoying this post! The McHugh Lake Trail is much smaller and less frequented. Bikes are NOT allowed this way and we didn’t see a single other person after coming down from the hill next to Rabbit Lake. We analyzed the scree fields along the ridge in front of us and stared at Suicide South. Most of us wanted to try and see if we could get to the peak but everyone agreed to aim for the ridgeline first and see how we felt from there. We had to cross a small river and make our way across a marsh before we could actually pick our way up the steep side of this mountain. The tundra made for nice footing and the first half of the way up this ridge was relatively easy. It wasn’t until the greenery beneath our feet was replaced with rocky scree fields that I started to wonder whether we’d get all the way to the summit today. It took about an hour and a half to reach the top of this ridgeline and everyone quickly agreed that we should just hang out here and enjoy the view rather than push onwards. Snow-capped mountains went as far as the eyes could see in almost every direction! We had a clear view of the Turnagain Arm right beneath us and Cook Inlet with some ivory peaks in the distance too. Alaskan summers mean endless daylight and are great for hiking! Looking back down the way we came it suddenly dawned on me just how steep this trek was! Rabbit and McHugh Lakes were another 1500 feet below us shimmering in the afternoon sun. After a few more snacks and photographs we accepted the simple truth that we had a 4 or 5-hour journey back to the car and started our descent. Hiking down a scree field is actually a lot easier than going up one. I took large steps and “rode” the gravel beneath me down an extra few inches with each step. We made our own path switchbacking down and quickly found ourselves back at McHugh Lake. We took one last stop at Rabbit Lake to pick up some gear we opted NOT to carry up the mountain and said our final goodbyes to this fantastic valley. The sun shone brightly on our way back despite the fact that it was nearing dinnertime. The walk back to the parking lot starts with a short uphill and then is mostly downhill following the same trail that we took in. Wildflowers dotted the landscape and I noticed a circular rock pattern which made me think a boulder had fallen off the mountain and smashed to bits. Alaska continuously reminds of mother nature’s immense power. Thank you for reading! If you made it this far down I hope you’ve already subscribed and are excited to read my next post. Be sure to share this post using the buttons on the left or pin the image below!